Etheldreda Downing Hovey (1880-1917) was the wife of Horace Scudder Klyce (Americanized from Kleis), a controversial philosopher, scientist and Naval officer. She was one of 5 children, the daughter of Henry Emerson Hovey and Sarah Louise Folsom. Her only brother, Charles Emerson Hovey, died at age 26 in the Philippines while serving in the U.S.Navy in 1911. His portrait memorial relief and two commemorative plaques by F.W. Allen are on the base of the Hovey Fountain in Prescott Park, Portsmouth, NH. Etheldreda was born in Brooklyn, NY, married Klyce in 1908 in Portsmouth, NH, had one child, Stephen and died in 1917 at age 37 in Winchester, MA. Her husband remarried and had two more children. (ancestry.com) The cause of her death is unpublished, but the Howells suggested that she experienced a great deal of sadness. What an emotional portrayal this portrait is! The eyes are the first thing one notices. They are penetrating and expressive. One looks sad, dreary and deep, the other is bright, open and realistic. The attitude of the head, slightly tipped at the neck and turned on the line of the shoulders, expresses vulnerability while the bone structure of her face, her strong square jaw and broad forehead show her strength and bravery. Yet the clear lines of her gathered mouth and slack jaw behind it gives the appearance that she is holding back her tears. Her small nose is straight at the bridge and the philtrum below is shapely. Such depth and contrast in such a shallow relief! And although this is just a rubbing of the missing bronze portrait, the skill it took to produce a work that translates even onto a rubbing is remarkable. It looks like a painting in clay with the expert tooling of the wisps of hair in the loose puffed up-do of the time. The texture of the hair around her face balances the smoothness of her skin and almost looks like a crown. Her long slender neck is elegant with the simple contours extending down below her collarbone and showing a bit of the flesh of her shoulders and chest. Look at the delicate lacy fabric of her dress with the irregular edge of her bodice showing off her beautiful smooth neck and skin. Her marriage was not happy, she bore only one child and she died tragically. This is a soft feminine portrait showing emotion and sensitivity to the lovely woman’s plight. Lace detail from Wisdom by Daniel Chester French, later cast as a bronze door for the Boston Public Library. Compare with Allen’s Etheldreda. Centered at the bottom is her name, ETHELDREDA, raised in simple large capitol letters. Allen’s signature and date are at the bottom right. There are some interesting coincidences between the families of the Howells and Allens. William Dean Howells was modeled by St. Gaudens who was introduced to him by his brother-in-law who was also a sculptor. St. Gaudens was Pratt’s teacher and Pratt was Allen’s teacher. The Howells lived in Kittery Point, ME and the brother of Allen’s wife lived across the river in New Castle, NH. The families were friends then as their offspring are today. William Dean Howells was Editor of Harpers Magazine and Allen’s cousin, Frederick Lewis Allen, was Editor of Harpers after Howells. F.W.Allen and F.L.Allen were both named after grandfather F.Deane Allen. The family friend, Dean Howells, was named after his grandfather W.Dean Howells. 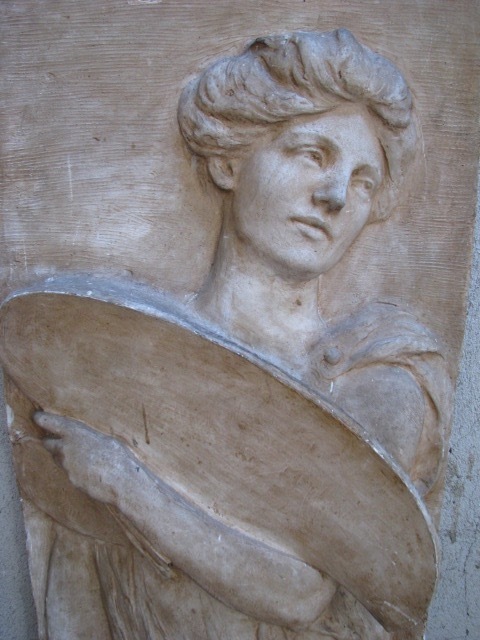 Artist by Daniel Chester French shown as a comparison to Allen’s Etheldreda. Photographed at Chesterwood in Stockbridge, MA. William Dean Howells (1837-1920), known as “The Dean of American Letters” was at the center of American literary culture for over fifty years. His grandson Dean went to Harvard with Agnes Allen’s nephew, Henry Horner, son of her brother Robert. They became fast friends at their homes across the Piscataqua River, the Howells in Kittery Point and the Horners in New Castle. The families have remained friends and stay in touch both in their summer homes and in winters in Washington, DC. New Castle is the place where the renown Boston School artist Edmund Tarbell had his summer home in which he painted many of his famous works. In New Castle he gave summer classes by the water with Frank Benson, our best known American Impressionist painter. Together they created a stage scene on canvas depicting the entrance to the historic Revolutionary Fort William and Mary which can be seen on a point of land just beyond the Horner/Hart home on the shores of the Piscataqua. The painting was found by Nancy Horner Borden, President of the New Castle Historical Society, hanging on the Town Hall stage behind other curtains. It is on display at the Historical Society. Tarbell’s son Edmund is also a friend of the Horner family from when they both summered in New Castle. Sally Horner Smyser and her husband Richard spend their winters in Washington, DC where they socialize with the Howells. One summer day, Dean sped across the river to The Anchor, the old Horner summer home, to deliver a copy of a rubbing of his Aunt Etheldreda to Allen’s granddaughter, Christina Abbott, who often spent summer weekends there. In a note to her afterward Dean mentions that Allen modeled Hovey’s portrait before his death. 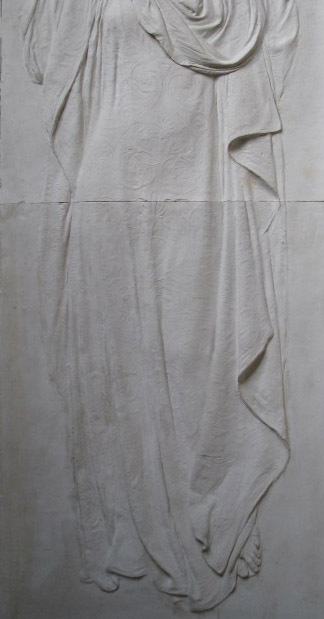 In researching the bas-relief among family members, he was unable to locate the original bronze, but this paper rubbing suffices to show the sensitivity of the modeling of this woman’s sadness. Presumed to have been cast in bronze sold for $100.